Diaz de la Portilla is scheduled to be term limited in 2018 but his brother, Alex, is rumored to be interested in returning to the Senate as well. The amended map has the effect of protecting his re-election chances and those of Sen. Anitere Flores, also of Miami. Both had been drawn into the same Miami-Dade district in the original Senate map — along with Sen. Dwight Bullard, D-Cutler Bay. Diaz de la Portilla’s change now gives Flores and Diaz de la Portilla separate districts and increases the ability of his brother, Alex Diaz de la Portilla to replace him. Miguel, the elder brother, lives in Coral Gables while Alex lives in Little Havana. Both are in the same district under his proposed map. But, when challenged by reporters Tuesday, Diaz de la Portilla said the change is defensible. The current map "basically disenfranchises Hispanics in Miami-Dade County,'' he said. "This map is an improvement over any of the maps offered." Doesn't his change also remove the conflict with Flores? Won't a judge raise questions about that? "It has absolutely nothing to do,'' with that, Diaz de la Portilla told reporters. "I think the record is very, very clear and you can go to the recordings of when the maps were drawn -- and they're all there, it's a matter of public record, I encourage you to take a listen. You'll see the key here is we've had three Hispanic seats in Miami Dade County for almost 30 years now." Miami Sens. Diaz de la Portilla, Flores and Rene Garcia talk on Senate floor during redistricting debate. The map originally proposed by Senate leaders, "merged Doral with Little Havana," packed Hispanics and split Little Havana. He said the so-called functional analysis showed "it did not perform for three Hispanic districts." Did you consult or mention these things with your brother? "Oh, I've mentioned it to my brother, of course. I've mentioned the idea of Miami Dade County preserving three Hispanic majority seats because it's important to my community." Photo: Miami Sens. 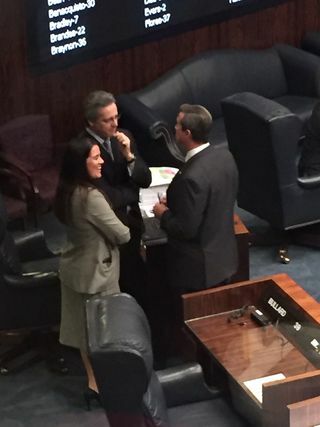 Diaz de la Portilla, Flores and Rene Garcia talk on Senate floor during redistricting debate. Why weren't these objections raised last week? He said he filed amendments to every one of the base maps. Is 60 percent of Hispanic participation not enough? "The last functional analysis we had in 2012...you saw the Hispanic voters did not select the candidate of their choice." "Take a look at the numbers again." The 2010 primary and the 2012 general election. He argued that relying only on minority voting age population is not a good measure, particularly with language minorities. "Voting age population does not indicate voters...You could have 100 Hispanics. It doesn't mean you have 100 voters. A lot of people in Miami Dade County arrived for economic reasons. Some fleeing oppression. Some for economic reasons to find better ways for their families. But a lot of the folks who make up the Hispanic voting age population are not voters." Have you changed your pledge on the Senate presidency? "This has nothing to do from my perspective with the Senate presidency or anything like that. This only has to do with tier one and tier two and making sure we don't lose Hispanic representation, because it's important for the Miami Dade community." What will the House do? "That's up to the House but this map on its face is tier one and tier two compliant." Will there be a fourth Hispanic district? "We tried to get a fourth Hispanic seat in 2012. But the numbers just weren't there. But I believe the day will come -- and it's not too far away -- when we'll have that fourth Hispanic seat. With 49 percent of the Miami Dade population Hispanic 40 years ago, it's now 69 percent. I don't think Miami Dade County is going to get any less Hispanic over the next decade. I think it's going to get more Hispanic." They also are not always registering as Republicans? "I don't care what they register as...I represented by community in a non-partisan seat as a county commissioner...I am probably the least partisan person you'll find in the Florida Senate."